Your child has achieved another milestone; graduation from kindergarten is a big deal! Remember dropping off your little one at school and they cried while your heart sank? They cry no more and march into their classroom all by theirself. Your child is ready to embrace their full-fledged membership into grade school and what better way to celebrate than with a medal! 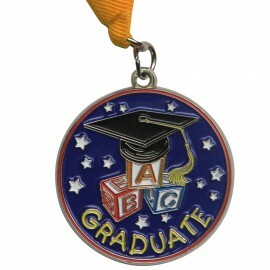 Our silver medallion with detailed colored plating and a durable gold neck ribbon is a perfect way to recognize your child’s achievement through kindergarten.